An unsigned chalk, ink and pencil portrait of a Renaissance beauty known as “La Bella Principessa” (the beautiful princess) has been attributed to Leonardo using a method more commonly associated with police procedural dramas: fingerprint analysis. 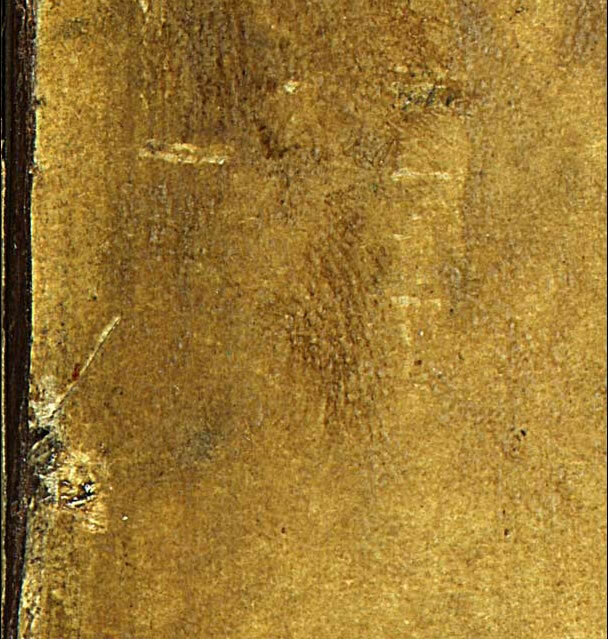 Forensic expert Peter Paul Biro found the fingerprint and partial palm print on the canvas and matched it to a fingerprint found on Leonardo’s “St. Jerome in the Wilderness” in the Vatican. Biro examined multispectral images of the drawing taken by the Lumiere Technology laboratory in Paris, which used a special digital scanner to show successive layers of the work. This is great news for the Swiss collector who owns the piece. 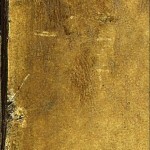 He bought it for a ridiculously low sum last year when Christie’s sold it as an anonymous 19th c. German school piece. If the attribution holds, this will be the first new Leonardo to be discovered in over a hundred years. It could be valued at something in the neighborhood of $150 million. Bought for $19,000, sold for $150 million. I doubt there’s ever been a better return on investment in the art world. Needless to say, Kate Ganz, the New York art dealer who bought the portrait in 1998 for around the amount she sold it to the Swiss collector for 9 years later, insists that this new information doesn’t change anything. As far as she’s concerned, it’s absolutely not a Leonardo la la la I can’t hear you. I can’t say I blame her for sticking her head in the sand. How do you sleep at night after having had something so beautiful, so precious in your hands for a decade unrecognized, only to give it away at cost? This entry was posted on Friday, October 16th, 2009 at 9:53 PM	and is filed under Renaissance, Treasures. You can follow any responses to this entry through the RSS 2.0 feed. You can skip to the end and leave a response. Pinging is currently not allowed. Poor Kate Ganz, of course she is in complete denial! 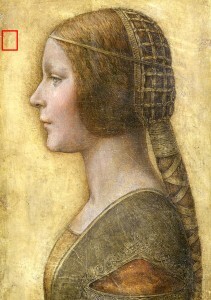 I think it’s a lovely portrait though, Leonardo or not. She’s a beauty, no question. Maybe it’s a hindsight 20-20 thing, but it’s pretty obviously a Renaissance piece to me. I don’t know what 19th c. German art looks like, though, so what do I know. And a William Turner, if I recall correctly. Examining paintings for microscopic and fingerprint evidence of attribution is his job. That’s not to say his attributions are therefore indisputably correct. There’s always controversy. i’ve just discovered your blog…. can i just say, your style of writing really makes me laugh…. the comment (la la la) on the previous da Vinci owner, made me laugh out loud…..